A high-profile case can land in your court with little or no warning. If unprepared, such cases can create chaos, absorb resources, and place your court at the center of an intense media spotlight. Judges and court professionals now have instant online access to the tools necessary to plan and manage high-profile cases in their courts. The new Managing High-Profile Cases for the 21st Century website is a joint project of the National Center for State Courts (NCSC), the Conference of Court Public Information Officers, and the National Judicial College. The project was made possible through a State Justice Institute grant. The new website offers best practices, techniques, and tools that have proven useful to courts that have experienced high-profile trials, in addition to checklists to help the trial judge, administrative officer, security personnel, jury managers, and others provide public access while ensuring a fair trial. The website also features the top six considerations for courts confronted with a high-profile trial, such as who will be on the leadership team, and what unique challenges will arise from this case? The website helps courts identify solutions to the six questions. NCSC’s 1998 publication, Managing Notorious Trials, provided the basic framework of information, and an advisory committee of expert trial judges, court administrators, public information officers, and others added insights about new issues in high-profile case management. BC Provincial Court’s Second Twitter Town Hall a Success! On April 6, 2017 Chief Judge Thomas Crabtree kicked off the British Columbia (BC) Provincial Court Law Week activities with the Court’s second live Twitter Town Hall. 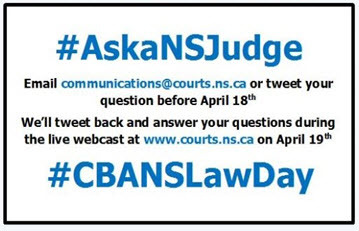 As he had the previous year, the Chief Judge spent two hours tweeting responses to questions and comments tweeted to #AskChiefJudge. Once again, there was a range of participants – justice system organizations, lawyers, students, and people with legal problems – and a range of questions. Traffic during the Town Hall, held from 11:00 am to 1:00 pm this year, was busy. The Court’s Twitter handle, @BCProvCourt, was used so often it was declared to be “trending in Vancouver” during the event. Including questions sent in advance, the Court received 176 tweets (77 questions and 69 comments) and responded with 129 answers and 9 comments. Several questions received more than one reply, as the Chief Judge included links to reference material – articles, reports and judgments – to supplement his 140-character tweets. Justice and law-related groups were invited to share helpful information and resources during the Town Hall and their contributions accounted for many of the comments. Access to justice was a popular topic. There were suggestions for night and weekend courts, discussion of “unbundling” legal services, and talk about the expansion of the new online Civil Resolution Tribunal to include Small Claims cases up to $5000. Several participants expressed concern that the Civil Resolution Tribunal Act prohibits people from using lawyers in that process. Others asked if different types of cases might be moved online. There were questions about how judges are appointed and how to increase diversity on the bench. Technology, the importance of using plain language, restorative justice, and First Nations Courts were other topics raised. Judges’ use of social media also prompted discussion – including an exchange with a Dutch judge in Dutch! Associate Chief Judges Gillespie and Wishart, Judge Jamieson, Digital Communications Coordinator Judge Ann Rounthwaite (retired), Legal Officers Caroline Berkey and Karen Leung, and staff members Alicia Perez and Lauren Van Leeuwen formed the Court team supporting the Chief Judge in this year’s Twitter Town Hall. Clicklaw Coordinator Audrey Jun, Karen St. Aubin and Travis Dudfield of the Canadian Bar Association BC Branch, and Meghan Maddigan from the Law Society of BC also participated and helped with publicity. See many of the 2017 Twitter Town Hall tweets and responses here (scroll to the bottom to read in chronological order).